Typ média:DVD+RW; Druh balení média:Slim. 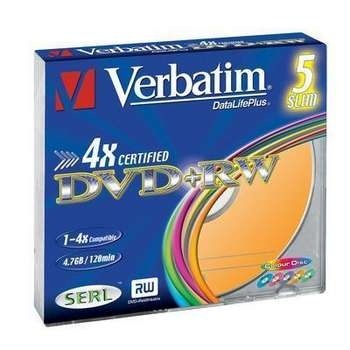 Verbatim's DVD-Rewritable (as well as CD-Rewritable) use a Super Eutectic Recording layer (SERL). SERL ensures that noise-free recording can be enjoyed time and time again. With conventional rewritable media, the recording layer deteriorates with every rewrite, meaning a decrease in quality. With Verbatim rewritable media however, the recording layer is returned to perfect condition on every erase cycle, leaving a flawless disc for the next recording. SERL also enables the media to enjoy excellent archival stability and high-speed recording. This means users can enjoy perfect, high-speed data storage every time. Recordable in CLV (Video or CAV (PC data) formats. Read compatible with most DVD video players and DVD-ROM drives.